Happy New Year everyone! 2012 was an incredible year in the New Contemporary Art scene. We saw many emerging artists hitting their stride and presenting captivating art in reputable galleries, witnessed a 'Lowbrow' graphite Queen break barriers by showing at a ‘highbrow’ gallery, and had the chance to chat with many wonderful artists who each embody an amazing talent and unique aesthetic. But enough about our memorable moments of the past year, we want to highlight the 2012 posts that fascinated our beloved readers. Take a look of the top 12 posts of the year as decided by you guys and while we have your attention, we’d like to thank you for all the love and support because this wouldn’t be possible without you! We hope you continue to enjoy all that Platinum Cheese and the art scene has to offer. See you in 2013! Scott Belcastro’s paintings are a meticulous study of endless landscapes and skies; a struggle between illustration and abstract expressionism, telling stories of inner silence, loneliness and the search for something larger within ourselves. In anticipation of his show at Iam8bit Gallery entitled ‘Brighter Doom’, we had the chance to talk with this unique artist about his creative process, growing up in upstate New York and the inspiration behind his latest work. Read the full interview here. On April 21st, Merry Karnowsky Gallery unveiled Greg ‘Craola’ Simkins first solo exhibition with the gallery entitled ‘Cloud Theory’. As the show title suggests, clouds are the foundation for this collection by the artist. Taking a cue from a favorite childhood pastime of staring at clouds and daydreaming them into shapes, Simkins began each canvas with loose cumulus forms and allowed the subjects to form organically. View opening photos by Jennifer Strausshere. Last Rites Gallery hosted a group exhibition in July guest curated by Jon Beinart entitled ‘Taboo’. Featuring over 50 artists, ‘Taboo’ explored the forbidden unashamedly, fearlessly and sometimes with humour. In a society run riot with political correctness, this exhibition has given an exceptional group of artists a forum to challenge, surprise and even confront the public. View the sneak peek here. 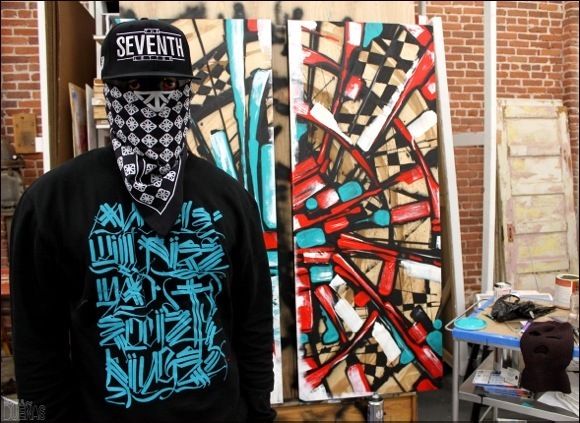 On February 11th, Known Gallery debut the collaborative exhibit from Zes and Retna entitled ‘Excavated Revelations’. The show marked a rare opportunity to see two street art innovators as Zes rarely does legal pieces and Retna has ‘blown up’ in popularity over the course of the year. Many checked our the teaser of Zes in his studio courtesy of Michael R. Dueñas who co-directed and produced the video. View the video here. On March 1st, Siren Studios debuted Gregory Siff‘s latest collection of work entitled, ‘There & Back’, which included his signature Pop/Abstract paintings along with a collaborative installation with students from the non-profit organization, Communities in School. Blurring the lines between Pop Art and Abstract Expressionism, Siff’s work embodies the art of the eighties while presenting the viewer a visual map of his reality; drawing from experience, conquest, loss and love. View opening night photos by Jennifer Strausshere. In July, Ace Gallery debuted a collection of Laurie Lipton’s newer works, unified by the banner: ‘L.A. – Sous Real’. Featuring grim interpretations of everything from reality TV to cosmetic surgery to wall-to-wall traffic, Lipton exposds her audience to the depraved mechanized rituals lying just beneath the surface of their own everyday lives. Read the entire write-up by Mr. Cheeks here. 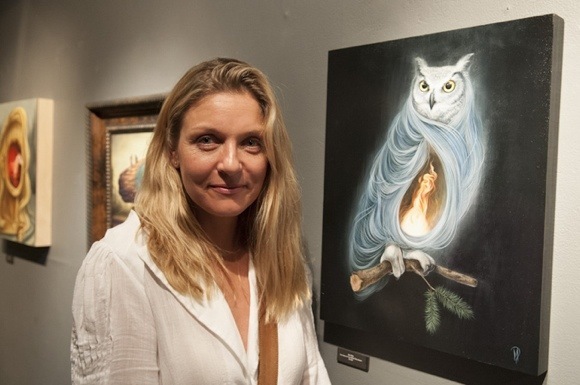 On April 21st, Copro Gallery presented ‘Fire Walk with Me’, an exhibition curated by producer Robert Wilson. Celebrating the 20th anniversary of David Lynch’s film ‘Twin Peaks: Fire Walk with Me’, the exhibit is a sequel to the ‘In the Trees’ exhibit at Clifton’s Cafeteria back in February 2011. View opening night photos here. Every time you turn around the German based art duo, known as Herakut, is leaving their creative mark in Los Angeles. In February 2012, the street artists joined artistic forces with the circus troupe, Lucent Dossier, for a performance at the legendary Palace Theatre along with yet another exhibition and book signing party appropriately titled ‘After the Laughter’. In the midst of their busy schedule, Hera graciously accepted to have a chat (and some coffee) so we could learn a little more about their creative process, life growing up in Germany and the first time she and Akut painted a wall together. Read the full interview here. 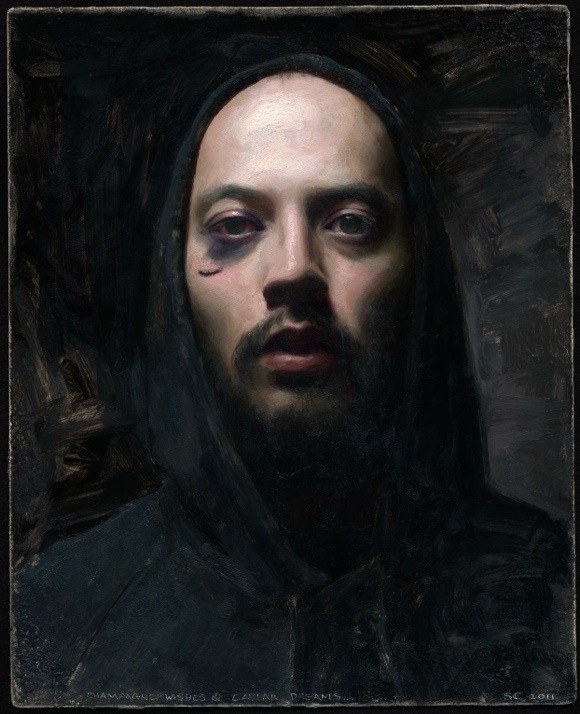 Sean Cheetham has a gift for presenting alternative-looking people in a very formal, classical way and his 2012 show at Katherine Cone Gallery was no exception. ‘Champagne Wishes and Caviar Dreams’ continues upon his edgy, yet formal aesthetic with portraits of lone women wearing elaborate clothing and distant stares. View more of the artist's works here. Influenced by the elegance of Anthony Van Dyck and the mysterious melancholy of the late 19th century Belgian and French Symbolists, Gail Potocki evokes a true hybrid of nostalgia and innovation. As one of the artists participating in the ‘Femme Fatale’ show on February 25th, we had a chat with this unique artist. Here Gail talked about the inspiration behind her painting for the show and why being a ‘late bloomer’ has its advantages. Read the entire interview here. Portraying women in easy, flowing lines with soft hues, Stella’s portraits transcend the typical critiques of feminine beauty inherent in today’s self conscious society. As one of the artists participating in the ‘Femme Fatale’ show on February 25th, we had a chat with this unique artist. Here Stella talked about how she ‘lucked out’ as an artist, the symbolism behind her subjects’ hair and why he’s so inspired by the female figure. Read the full interview here. Guests were seduced, ensnared and dangerously dazzled on a cold February night as Cella Gallery debuted ‘Femme Fatale’. Curated by Stephanie Chefas and Nicole Bruckman, ‘Femme Fatale’ featured 39 new contemporary artists whose inherent aethetic is heavily influenced by the female figure. View opening night photos by Sam Graham here.